Nigel Short and Tenebrae’s residency and performances with us at Brigham Young University truly exceeded our already-high expectations. The talent and skill of these fine musicians is unsurpassed. Our students and patrons were transformed by the opportunity to learn from them and to watch them perform live, and we look forward to the time when we can welcome them back to Utah. There is truly no performance of Handel’s beloved Messiah quite like the ones offered by Tenebrae and Nigel Short at our venue this season. We will remember these performances for a long time to come. 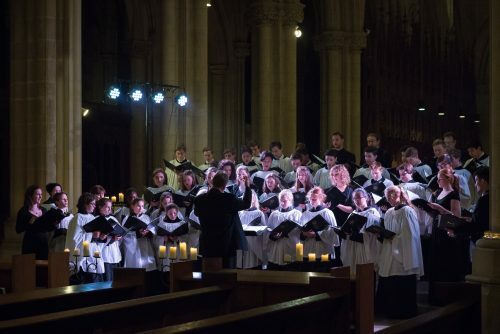 Back at home I had a delightful trip to Downside Abbey working with their school choir – the top line in particular was one of the best I’ve heard and included ex choristers from Salisbury and Wells Cathedral as well as a very fine treble who was formerly at Westminster Cathedral. He knew some of the Tenebrae chaps so it was lovely to see them greet each other like long lost brothers! What an amazing building and calm atmosphere. I am already nagging Henry, our manager, to see if we can go down there again to record our next disc in that glorious abbey. Congratulations too to the school’s Director of Music, Julian McNamara, who directed the choir and Tenebrae together in a stirring performance of Edward Naylor’s roller coaster of a motet, Vox dicentis. I even tried to join in on the alto part but I probably just succeeded in making lots of the singers smile…I wonder why? Special thanks to Trisha Rees-Jones and husband David who helped organise the concert and spread the word to make sure the place was full and bursting with excitement. Following our rousing Messiah at Cadogaon Hall, another quick jaunt down to the west country saw us perform for the first time as part of ‘Music on the Quantocks’, a splendid concert series run by some extraordinary volunteers who are truly dedicated music lovers and give of their time again and again to present concerts by some of the UK’s finest vocal groups around. Special thanks to Peter Lewis and his team who looked after us superbly (such delicious food!) and then we sang in an absolutely packed church to a very enthusiastic audience. It was the first time in a while that my wife, Grace, has sung with us so it was a particular joy for me! 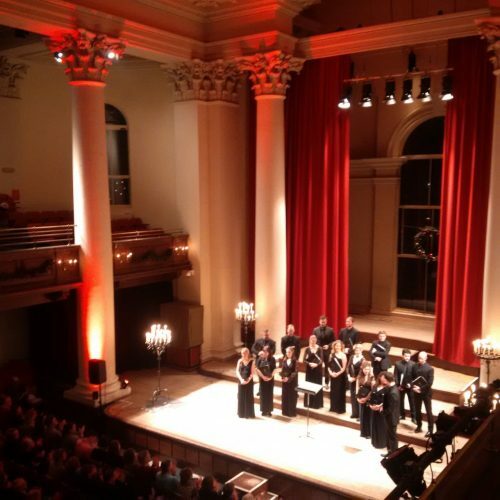 We finished off our Christmas season with a performance at St John’s Smith Square. It was great to see it packed to the rafters and with so many familiar and friendly faces in the audience. I can’t think of a better way to end the year than singing a programme like that and then enjoying some downtime afterwards in the Undercroft bar with lots of friends and supporters. And so…Happy New Year all! No rest for the wicked! I’m currently working on getting my voice going again for a couple of gigs with the Tenebrae Consort team at the Landmark Centre in Teddington and Portaferry in Ireland. The programme features lots of lovely Chilcott pieces and arrangements together this time with a few gems from Richard Rodney Bennett and some fun (and slightly tricky) numbers from Alexander L’Estrange. Fans of the King’s Singers will be familiar with their Great American Songbook disc but for us it’s the first time we’re being let loose on these brilliant arrangements. Can’t wait! Not long after we’re joining with the English Chamber Orchestra once again for a performance of Mozart Requiem, which, if our Messiah was anything to go by, should be spectacular! We hope to see you there!